St. Louis, MO/Keenesburg, CO: Innovative Timing Systems, the leader in race timing systems, is committed to giving back to the community and building strong relationships with their Jaguar timing customers. 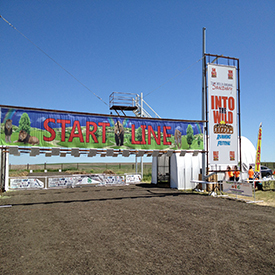 Through its partnership with The Wild Animal Sanctuary, a sanctuary in eastern Colorado that is devoted to rescuing abused, abandoned, and captive wildlife, Innovative Timing Systems has been able to bring the two together by giving back through running. In January, at the annual Jaguar User Conference, Jaguar timers came together to donate money for The Wild Animal Sanctuary. The funds donated by Jaguar timers helped sponsor the rescue of two captive and abused jaguars from Mexico. Negrita is a twelve year-old black female jaguar and Manchas is a three year-old golden male jaguar. The staff at The Wild Animal Sanctuary spent more than two years fighting furiously for the welfare of these animals. In March, they were finally rescued and arrived at the sanctuary, putting their years of abuse behind them. In addition to sponsoring the rescue, Kurt Hansen, CEO of Innovative Timing Systems, along with the help of staff and a local Jaguar timer, flew to Colorado earlier this month to help The Wild Animal Sanctuary put on their annual Into The Wild 5K/10K fundraising event by donating their timing services. “It’s an amazing experience for the participants because they get to run alongside large habitats where they see tigers, lions, bears, wolves, and many other beautiful animals. We donate our time and travel costs because we believe it’s important for our company to make a difference in the lives of these incredible creatures,” commented Hansen. “After the race, we were able to meet Negrita and Manchas. They are thriving in their new home at the sanctuary. These two jaguars are now healthy and will have the best life possible thanks to our family of Jaguar timers. We are thrilled to have been a part of their rescue,” added Hansen. Innovative Timing Systems, LLC is a privately-owned company, providing leading-edge sports timing solutions and race timing services through a network of over 500 locations around the world. ITS provides advanced chip technologies, race kiosks, large athlete displays, live web updates, automated race photos, social media integration and mobile apps. Founded in 2008, ITS is headquartered in St. Louis, Missouri and has sales, support, and engineering facilities in numerous locations around the world. The Wild Animal Sanctuary is the oldest and largest nonprofit Sanctuary in the world dedicated exclusively to rescuing captive exotic and endangered large carnivores, providing them with a wonderful life on 720 acres. The sanctuary currently shelters more than 400 animals and is the first sanctuary of its kind to create large acreage species-specific habitats for its rescued animals.